Luxury studios, one and two bedroom apartments. All apartments are fully furnished with air conditioning, fully equipped kitchen including a refrigerator, a balcony with table and chairs. . Maximum occupancy in a studio - 2 persons on regular beds + 1 extra bed. Maximum occupancy in a 2-bedroom apartment - 4 persons on regular beds + 2 on extra beds. Royal Dreams Apart Hotel (Sunny Beach) is located only 200 meters away from the longest beach on the Bulgarian Black Sea coast and is located on the third line in the southern part of the resort, just a few minute walk from Cacao Beach. Bourgas Airport is 30km away from Royal Dreams Apart Hotel. Royal Dreams Apart Hotel is located in the southern part of the most popular Bulgarian Black Sea resort - Sunny Beach. The complex is situated in a very convenient location in close proximity to numerous bars, restaurants, supermarkets, aqua parks, playgrounds, sports facilities and all kinds of other attractions. The complex is also located 5 minutes walk from the most famous place for nightlife in Bulgaria - Cacao Beach. There you can enjoy all kinds of music, all summer long there are visits from some of the best DJs in the world. Just a few meters from the complex is a bus stop, from where in a few minutes you can reach the center of the resort, St. Vlas and also the old town of Nessebar where you will find great seafood restaurants, with great views towards Sunny Beach. Royal Dreams Apart Hotel is a gated complex, which has a swimming pool for adults, children's pool and playground, area for lounges, as well as a restaurant. 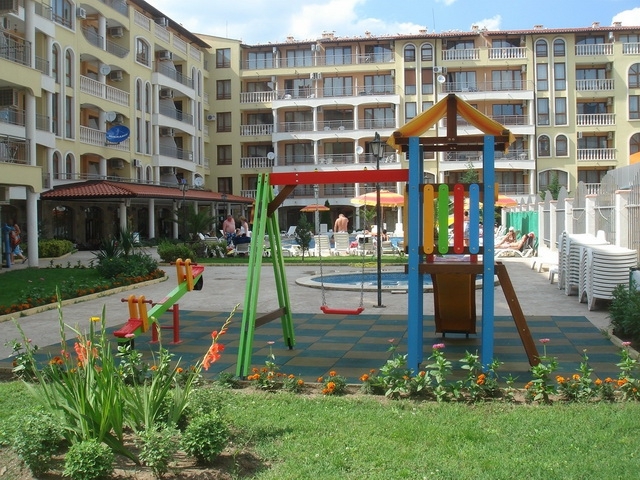 The Apart hotel is very suitable for families with children who want to enjoy a relaxing summer holiday in Bulgaria. The rental prices are in Euro for apartment per night and include free use of swimming pool, parking and tourist fee.